Pro-Constitutional forces pose in Mexico, 1914. Our monthly century news roundup has some interesting items this week. World War: One June 28, Archduke Franz Ferdinand is assassinated. Expect a future “context” post devoted entirely to this event. War Crimes: On June 12, Ottoman forces begin the “Greek Genocide,” in which Christian Greeks living in Turkey are slaughtered. Over the course of the next ten years, the number of Greeks killed will enter the hundreds of thousands. 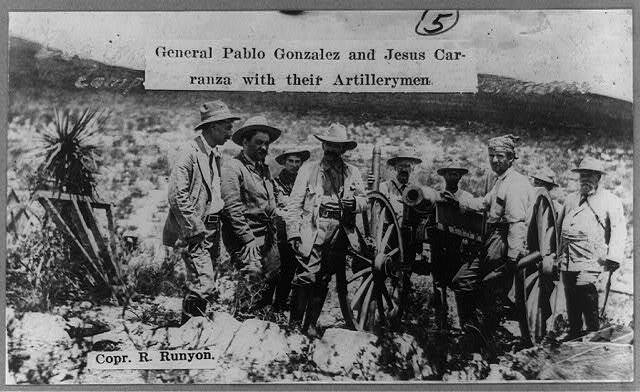 Revolution: Mexican “Constitutional Army” forces under Carranza take San Luis Potosi, demanding the surrender of President Victoriano Huerta, whose increasingly dictatorial regime has lost support both at home and abroad. Diplomacy: June 1, US President Woodrow Wilson’s envoy Edward Mandell House meets with Kaiser Wilhelm II of Germany. This can be seen as the first of many efforts by the President to prevent or end the First World War. Disasters: June 24, a major fire guts downtown Manchester, New Hampshire, causing $400,000 damage and injuring 19 firemen. Sports: June 9, Honus Wagner makes his 3000’th career hit for the Pittsburgh Pirates, the first player to achieve that record in the twentieth century. Births: June 7, Indian director Kwaja Ahmed Abbas (who made “Shehar Aur Sapna” and “Pardesi”), June 18, actor E.G. Marshall (memorable in “12 Angry Men” and also TV’s “Defenders”). Addendum/Errata: Last month, I failed to note the founding of Paramount Studios on May 8. Many apologies to the future producers of the “Star Trek” and “Friday the Thirteenth” movies!